Bencher, I. Temple 1559, Autumn reader 1562, gov. 1564-6. Speaker of House of Commons 1566. In 1563 he was again returned to Parliament for Steyning, no doubt through one of his Inner Temple connexions. Surprisingly for an up and coming lawyer, Onslow, as far as is known, made no speeches and was appointed to no committees in the 1563 session. Though the journals are defective, the complete absence of his name creates a doubt as to whether he was present, but there is no evidence that he was not. Onslow was made recorder of London after the end of the session, and was expected to represent the City in Parliament, in accordance with custom. Two of the later Crown Office lists for this Parliament actually give his name as one of the London Members. 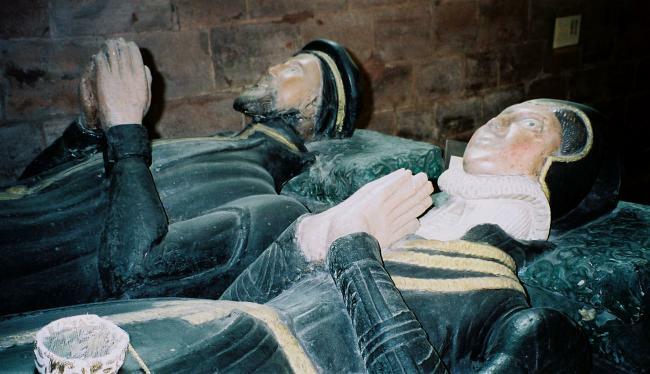 However, Onslow resigned the recordership, on becoming solicitor-general, before the 1566 session of Parliament began. As solicitor-general his proper place was in the Lords, with a writ of assistance. Such a writ was issued (possibly the fact that he was MP for Steyning was overlooked), but when Speaker Williams died and the government wished Onslow to succeed him he reappeared in the Lower House, still MP for Steyning. On the motion of the comptroller of the Household, the Commons went through the form of asking the Lords to restore Onslow to their House, and he was duly nominated Speaker. Normally the disabling speech made by a Speaker-elect on his nomination was purely formal, but Onslow himself raised the substantial objection that his oath as solicitor-general was incompatible with the office of Speaker and his election was agreed to only after a division 82, for, 70 against. A division on the election of a Speaker was rare, so rare that the Spanish ambassador mistakenly took it to mean that two candidates had been nominated. When on the next day Onslow was formally presented to the Queen as Speaker-elect, he again mentioned the difficulty arising from his office. Although thereby for the Prince is provided many princely prerogatives and royalties, yet is it not such as the Prince can take money or other things or do as he will at his own pleasure without order. God grant, as your Majesty hath defended the faith of Abraham, you may have the like desire of issue with him, and for that purpose that you would most shortly embrace the holy state of matrimony. my whole heart and mind may be occupied and employed in godly and heavenly things touching mine earnest repentance of my former sinful life and my spiritual comfort and consolation in my God by His merciful promises of forgiveness of my sins and free gift unto me of everlasting inheritance in heaven through the precious death and bloodshedding of Jesus Christ, mine only Saviour and Redeemer. He appointed his ‘entirely beloved wife’ executrix (she afterwards married Richard Browne I), as the elder son Robert was only ten. Kinsmen and servants were to receive black gowns, and all who had been in his employment for a year, a year’s wages. The Earl of Leicester (to whom he was ‘most bounden’) and lord Burghley (his ‘especial good lord’) were respectively to have ‘my best standing cup with a cover’ and a gilt bowl. Peter Osborne, John Marshe William Leighton were the overseers. Probate was granted on 25 Apr. 1571. 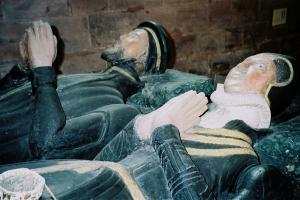 Onslow was buried at St. Chad’s, Shrewsbury on 7 Apr., his body being brought from Harnage, some miles outside the town, where he had been lying ill. An inscription on his ‘fair raised tomb’ gives the dates of his life and offices, and describes him as of good stature, agreeable mien, and grave voice. In 1742 Arthur Onslow, one of the two later Speakers of the House of Commons in the Onslow family, had the monument repaired. 1. Vis. Salop (Harl. Soc. xxix), 379 and Vis. Surr. (Harl. Soc. xliii), 154, where he is given as 1st s. of Roger, and his father-in-law is called Richard Harding; Manning and Bray, Surr. i. 537 seq. ; CPR, 1560-3, pp. 52, 117. 2. CJ, i. 50, 73; Trans. Salop Arch. Soc. (ser. 1), iii. 269-70; Masters of Bench of I. Temple, 10; Cal. I.T. Recs. i. 139, 201, 221, 233, 236 et passim; HMC De L’Isle and Dudley, i. 323; Somerville, Duchy, i. 320 n. 3, 333, 414-15; CPR, 1560-3, pp. 279, 523; 1563-6, p. 474; 1566-9, pp. 385, 396; Cam. Misc. ix(3), p. 60; H. E. Bell, Ct. of Wards and Liveries, 22-3. 3. Surr. Arch. Colls. xxxix. 65-7; Cal. I.T. Recs. i. 139, 186-7; J. A. Manning, Lives of the Speakers, 230; PCC 9 Daper. 4. C193/32/6, 7; HMC 7th Rep. 621b; CSP Span. 1558-67, p. 583; A. B. Beaven, Aldermen, i. 275, 289; CJ, i. 72, 73, 76, 78, 81; D’Ewes, 96-8, 121, 135; Neale, Parlts. i. 145, 153, 157, 159, 171; P. Laundy, Office of Speaker, 169-71, 454; HMC 14th Rep. IX, 473-6; CSP Dom. 1547-80, p. 255; H. Owen and J. B. Blakeway, Hist. Shrewsbury, ii. 167; Trans. Salop Arch. Soc. iii. 269-70; Wards 7/5/16, 42; 7/13/131; CPR, 1558-60, p. 406; 1560-3, pp. 52, 117, 237, 404, 417; 1563-6, p. 274; 1566-9, p. 392; PCC 14 Holney; HMC 15th Rep. X, 16, 17; C. E. Vulliamy, Onslow Fam. 3-7; Suss. N. and Q. ix. 104; Manning, 234-5.